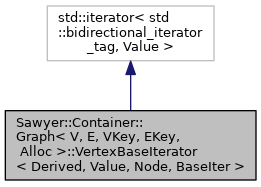 Base class for vertex iterators. Definition at line 861 of file Graph.h. Definition at line 871 of file Graph.h. Causes this iterator to advance to the next node of the vertex list. This method should not be invoked on an iterator that points to the end of the list. Definition at line 879 of file Graph.h. Definition at line 880 of file Graph.h. Causes this iterator to advance to the previous node of the vertex list. This method should not be invoked on an iterator that points to the beginning of the list. Definition at line 889 of file Graph.h. Definition at line 890 of file Graph.h. Two iterators are equal if they point to the same node of the vertex list, and unequal otherwise. Definition at line 898 of file Graph.h. Definition at line 899 of file Graph.h. Definition at line 903 of file Graph.h. Definition at line 906 of file Graph.h.